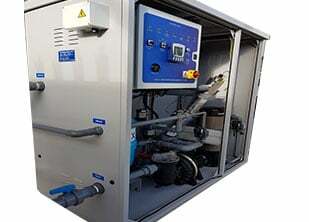 System UVEX offers an engineering solution to meet the challenge of maintaining water quality in commercial buildings. Established in 1987, we serve clients in all industry sectors throughout the UK and worldwide. 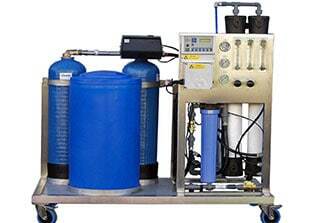 Our core products feature comprehensive, UV based water management systems. We also offer a broad range of other products and services. We are committed to quality, good customer service and to actively seeking a better environmental performance. System UVEX are ISO 9001 approved and quality has always been a top priority for us. We are committed to continuous quality improvement to help satisfy client requirements and expectations. We take pride in our customer service and provide a full range of after sales support. Our engineers are fully trained and will provide technical back-up and product training. System UVEX are LCA registered. System UVEX place great importance on environmental performance. We are ISO 14001 registered and are seeking to continually improve in areas such as waste, energy use and the sourcing of non-hazardous products. The UVEX concept for treating the water in cooling towers is really quite simple: reduce chemical use to a minimum and allow the UV system to do all the work. The UVEX CWU is designed to control microbiology and remove particulate debris in closed circuits. 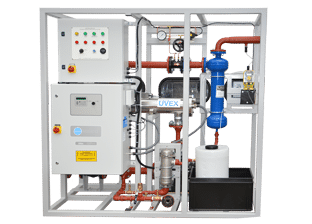 The CWU is connected on a side-stream from the main circuit and features a UV system together with a separator, pump and dosing set. System UVEX offer a wide range of additional products and services. We have partnerships with some of the best names in the industry. System UVEX are LCA registered and safe-contractor approved. In 2008 System UVEX began a process of improving environmental performance. In 2010 we achieved ISO 14001. Our objectives focus on reprocessing our waste and developing partnerships to reduce landfill, we have also begun design modifications to our products to reduce energy and chemical use. We believe UVEX products are currently among the best in terms of environmental impact, and our commitment in this area continues. We are a member of the Legionella Control Association, to view our certificate please click here.